Martha's Favorites: WELCOMING SPRING WITH TEA CUPS! 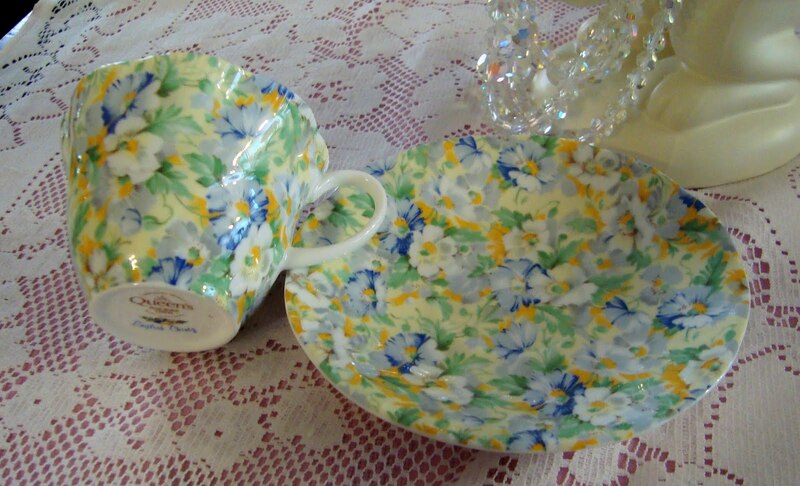 WELCOMING SPRING WITH TEA CUPS! Hello Ladies! Welcome to Tea Cup Tuesday No. 105! As I start this post I write with a heavy heart. This week three of my friends have lost someone they loved dearly. One was a young pastor of mine who had a massive heart attack at age 55. It is hard to deal with that much grief. Mexicans believe death come in threes. That is what happen this week, weird huh? My heart is also heavy for two of my children. One is getting ready to go into surgery while this other is weighting out a life changing decision. No matter how old, they never stop being our children and I am still wishing I can just give them a kiss to make it all better. Also on my heart is my dear sister-in-law will also be heading for the operating table in a few weeks, for a very serious surgery. I ask for your prayers for us this week as we seek God's direction and the peace that only He can give us. 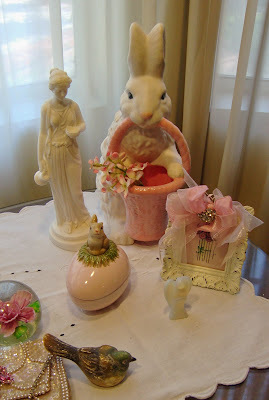 Easter is coming and next to Christmas, it is my favorite holiday. Christ and His Resurrection Power! I take comfort in that He will never leave me nor forsake me, regardless of what is going on around me. My Princess Maya was 9 years old this week. She will be making her acting debut in a community theatre this weekend. She is going to be in the WIZ! I am so proud of her. I will try to get as many pictures and I can to share with you next week. 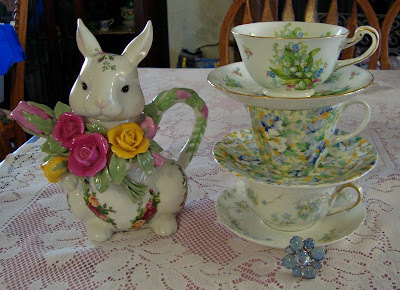 I will be sharing some Easter Tea Cups with you this month for your viewing pleasure :) ! 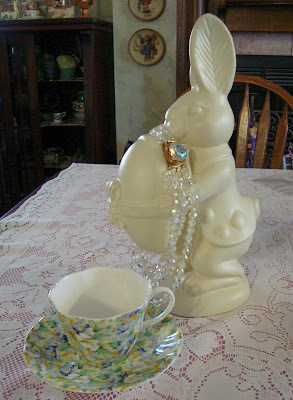 Did I ever tell you I collect Easter Rabbits? Well, you guessed it, I do! I am going to try to feature some the next few weeks. The very first cup I am sharing is this gorgeous Aynsley. It was giving to me by my sister-in-law and it is just one of my favorite cups. It has a daisy design which is her favorite flower. Amazing, don't you agree? Cup No. 2 is this Queen China, English Chintz. 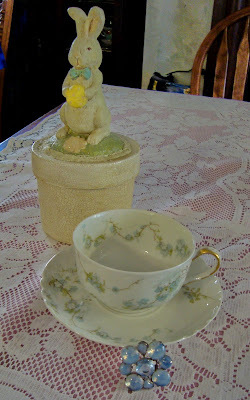 The colors of this tea cup are very different, you don't see Chintz cups without roses or in greens and yellows to often. My Mother purchased the cup that for me, years ago. Cup No. 3 is a Royal Chelsea, Made in England also. It just screams Easter! Love the colors on this one. My home is always so filled with different colors these next three months. Spring to me just says only different pastel colors will do. My last cup for this week is a Limoges. It is a Haviland, France my favorite. 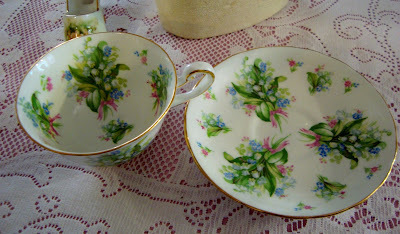 I don't have very many Limoges that are not in the pink colors so this one is rare for me. 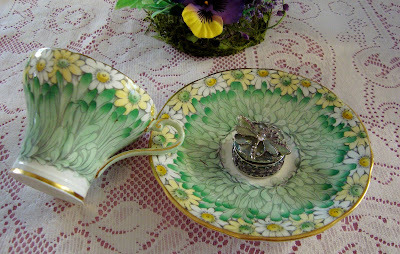 Love the delicate design that only Limoges can do. My every day dishes are Limoges the design of the dish is the same however, my dish set is in the classic all white. I have a service for 15 and every time I pick up a dish to use, it makes me feel so special. As a fun note, I picked up this rather large serve for $1.49 a piece about 5 years ago at the thrift store. God was smiling at me that day! Here is Mr. Linky for this week. I can't wait to see what Terri has in store for us after her recent trip. I did not get around to visiting a lot of you last week because of what was going on here at home. I will make it all up to up this week I promise. I have been selected to teach a craft at a Women's Conference at our church. It is my very first. I will be making Tussie Mussies. I am so looking forward to it. Like I told you, I am addicted to Pinerest and I have found may fun example there. Wish me luck. I have a large group signed up to take my class. Pictures next week. Oh Martha, so much going on in your world! I will keep your family in my heart, and I wish you all the very best. Your china is magnificent! I love each set! 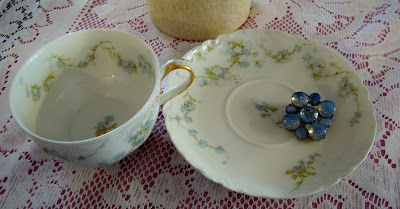 The blue chintzy one is maybe my favorite today....but the Limoges is winking at me...I might have to choose the Limoges : )Lol! 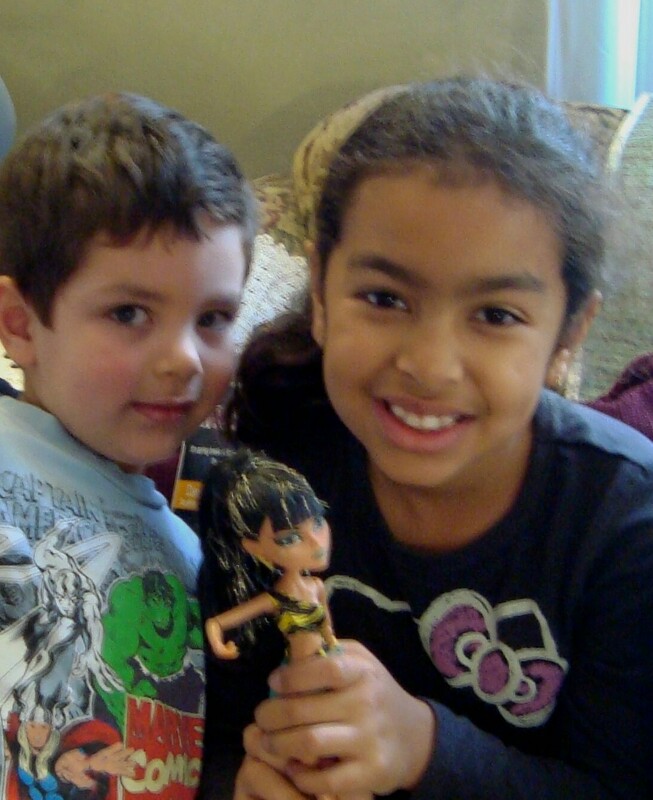 Noah and Maya look so sweet! Congratulations to your granddaughter on her theatrical debut! Yay for her! You must be so excited to see her. Congratulations also on teaching a class! You will do so well Martha! Prayers for you and yours. They do not seem to be enough, but they are the best we have to offer. How nice that you have your bits of prettiness to lighten your days. The chintz teacup is my favorite. What a delightful challenge. We need some of those too. Thank you. Spring, and Easter, and Hope Everlasting! I am so sorry to hear about the difficult things going on right now. I will definitely be praying for you and your family. It is comforting to know that HE knows all about it and can comfort us. First of all, I'd like to send prayers your loved ones, i do hope the surgery goes well and may GOD give guidance on the life changing decision your child's going to make! I'm so sorry for your loss. I absolutely love your collection of teacups, they're so beautiful! the bunnies are adorable and I congratulate you for being selected to teach craft at a women's conference in your church, I'm sure you will do well as you're so talented and very crafty! I also want to wish princess maya's 9th birthday and wish her success on her acting debut! so exciting and im sure she's excited to be in the WIZ! do share the pictures when you took them. 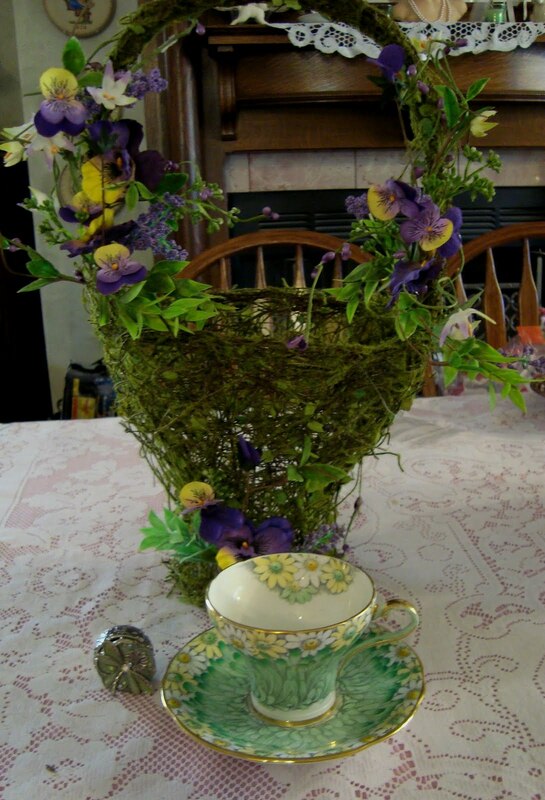 Thank you for sharing and hosting another tea time Tuesday! Well, God bless you Martha! What a time you're having! I'm glad you have some good things to look forward to, like Maya's acting debut and you teaching a class. Your teacups are gorgeous! I love chintz as it's always my favourite. Such prettiness you have shared today. Thank you and enjoy this first week of springtime. Oh, Martha, I am so sorry for all your losses. It just seems to be too much for one person to handle. My prayers are set for you, the families that lost the loved ones, and for your family's health. Thank God for our Saviour to carry these burdens. Your granddaughter Maya is certainly adorable and I wish her the best for her performance. 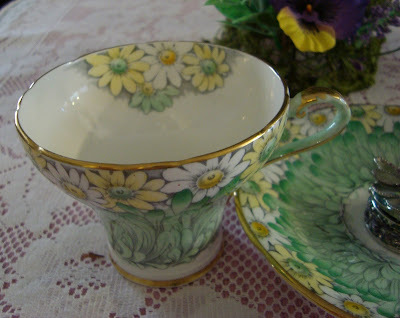 I just have one thing to say about the BEAUTIFUL Aynsley Daisy cup....I WANT IT!! lol...Daisies are my favorite flowers as well. That is just a beautiful set! 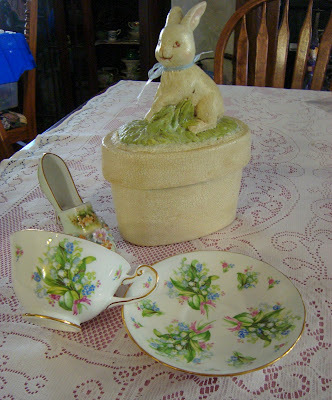 I love the Queen China and what a wonderful item to still have from your mother. Take care of yourself, Martha. I dearly love your post today. You always have many beautiful items to share. God Speed on your craft class at your Women's Conference. I'm sure you will have many prayers going up for you. Martha, sending thoughts and prayers to you and your family as you face the all the chaos in your lives. I pray that HE helps you find calmness and peace and that all has a positive outcome. Your little acting princess is going o be wonderful in her début! Oh its been far too long since i stopped by ,Hugs for your loss and your worries,You are right they never stop being your babies.I guess this is life isnt it ups and downs turns we never saw coming.Your princess is beautiful.Your teacups devine,Seems the time of year for posts just did one on my childrens conversations with God when they were younger,May your Easter be blessed. Happy spring Martha! So happy for your little actress. Your teacups are lovely as always! Thank you for hosting! Your collection of teacups never ceases to astound and charm me. These are truly exquisite. I feel I am well acquainted with death. Praise the LORD He has taken away the sting of death to those who believe. My faith grows deeper, my appreciation, amazement and love. God will, I know, comfort beyond belief. Being a mother is a lifetime job - one of the most difficult too. Much prayer needed there. Hugs to you - and prayers. sometimes it seems to be a lot what we have to carry on. It is always a help to trust ib God. Other nice things happens also. I hope Maya's debut will give you a lot of proudness and fun. Your tea cups are so special, Martha. I can only say: Beautiful! Thank you for sharing all this treasures and for hosting this wonderful event. Oh My Dear Sweet Friend Martha! If you are hurting then I am hurting too!!! SO MANY things you are worrying about! I am sending Lots of Love and Prayers to you and yours! Your table arrangements are so appropriate to welcome Spring! Those flowery tea cups are gorgeous and to crown it all the sweet presence of your grandchildren! 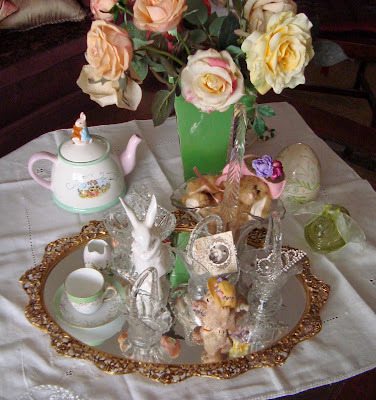 Beautiful and very elegant table arrangments, I love them! In case you wanted to visit again. I loved looking at your tea cups! TEA CUP VAVOOM! I HAVE BEEN PUBLISHED! THE DIVA AND THE TEA CUPS!